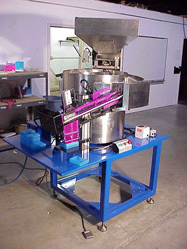 Ward Systems has extensive experience in precision robotic system manufacturing and integration for industrial applications, including high speed assembly, packaging, glue application and liquid handling for areas such as personal computer assembly, Keyboard assembly, mouse assembly, pharmaceutical disposable packaging, lab research, component testing, biological assaying and material application. We offer a wide range of robotic system services, from assembly to installation, and the gamut of capabilities in between. Whether an assembly, packaging, dispensing, sample moving, or pick and place type of system, we have integrated a high number of gantry, cylindrical, Cartesian, and SCARA robots. These have been turnkey cells including work stations and fixturing. We are innovative and cunning in our ability to create ingenious end-effectors that reduce end of arm weight & cycle time and increase throughput of our robotic systems. We offer a variety of end effectors to suit our customer's needs. We balance the use of tool changers with end effector technology to apply our multi-use tools. In addition, our robotic system experience provides engineering services including process and manufacturing engineering, product design, and equipment specification. Our robotic system offerings are vast and inclusive, and can be tailored to meet the specific needs of our customers. We stand behind our products, which meet industry and customer standards, as well as our high quality control testing. When experience, a solid knowledge base, and a customer-oriented attitude are what you're looking for in a company, look no further than Ward Systems. Contact us today for more information and let us show you how we can create the perfect robotic system for you.